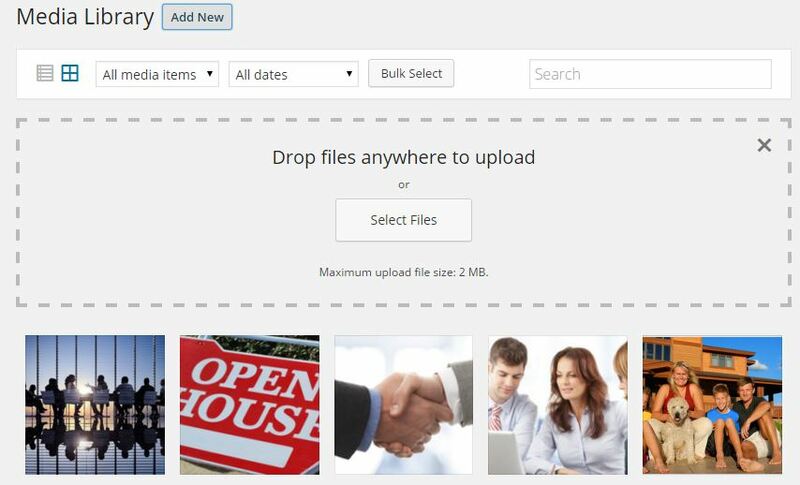 Media files such as images and documents can be uploaded to the admin panel for use throughout the website. Below is a list of file types that can be uploaded. **Media files are limited to 2 MB or less. To start uploading media files, we will need to navigate to the Media tab in our main navigation menu. You can click Media in the main navigation menu to go directly to the Media Library, or you can hover over Media to bring up the option to go to the Library or to Add New media. Before adding any new media to your library, especially images, it is important to make sure your files are named appropriately. Image filenames should be informative and provide a description of the image. This filename gives Google and other search engines important information about the image subject matter. 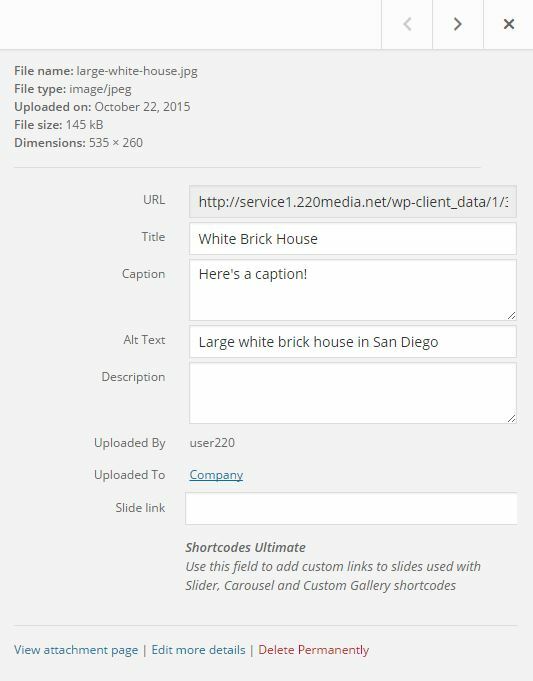 Uploading an image with the filename "image1.jpg" does not provide any information to search engines, while the filename "large-white-house.jpg" offers a brief description of the image subject matter. It is also important to upload quality images to your website. Low quality images can look unprofessional and have a negative affect on the appearance of your website. Make sure the image is at least as large as the area it will be used in. Uploading smaller images and increasing their size to fit a certain area will cause the image to become blurry or skewed. Clicking Add New will take you directly to a page to begin uploading images and documents. 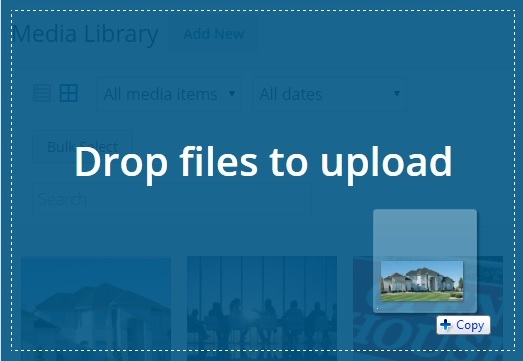 To add media to the library you can simply drag and drop files from your computer, or you can click Select Files to browse your computer. You can drag and drop as many files as you would like at the same time! If you click on Media or Library first, you will be taken to all of your current media files. You can drag and drop your images anywhere on the screen to upload new media. You can also click on Add New at the top of the Media Library to bring up the option to Select Files. When dragging and dropping files, your screen will turn blue and instruct you to Drop files to upload if done properly. Once this screen appears, you can drop your files and the upload will begin. Now that the files are uploaded we can click on each individual file to see and add additional information. 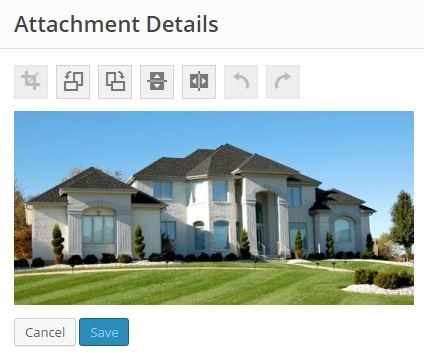 From the Attachment Details screen we can see information such as our file name, file size, and the dimensions of images. You can also edit your image Title, Alt Text, and Captions. Changes in this section are automatically saved. This works the same for both images and other allowable documents. 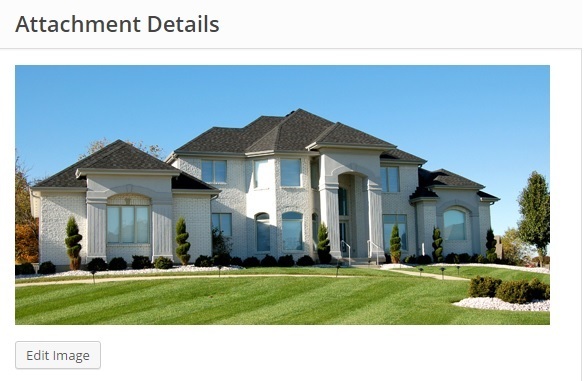 We will cover images as they are more frequently used throughout the site. On the left of our screen there will be a preview of our image. To the right of our image we have some important fields we can complete. The title field will allow you to title the images for internal use. Alt Text is the most important field in this section. Alt text provides a description of the image if a browser is unable to load the image. This is very important for visually impaired users as this text will be used to provide an audible image description. Alt text should provide an accurate description of the image. For a detailed look at image SEO, here is a great article by Yoast. 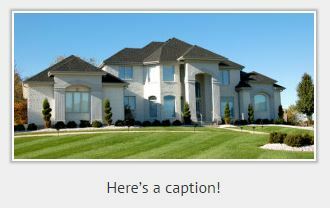 Captions will appear below the image when used in various places on your site. *Slide link will be only be used in unique instances. Image links will be controlled in other sections of the control panel. If you click on the Edit Image button below the image, additional changes can be made. 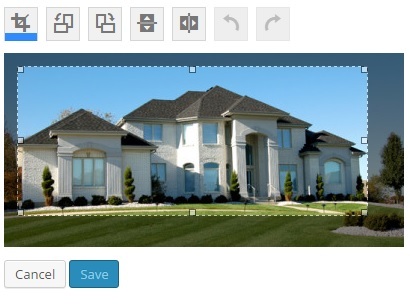 This section allows you to rotate, crop, flip, and resize the image. While the previous screen will auto save, this one will not. You will have to save your changes by clicking Save under the image. You may notice the crop button is not clickable immediately. In order to crop an image you will need to first highlight a section of the image with your mouse. This will allow you to then click the crop button.